An existing menu can be selected that will be controlled by the flat menu. The depth of the drop-down menu can be defined here. If, for example, a menu structure has 5 levels, you can choose to only display levels 1 and 2 in the drop-down menu. A submenu, which can also be selected here, could then be used to display the remaining 3 levels. 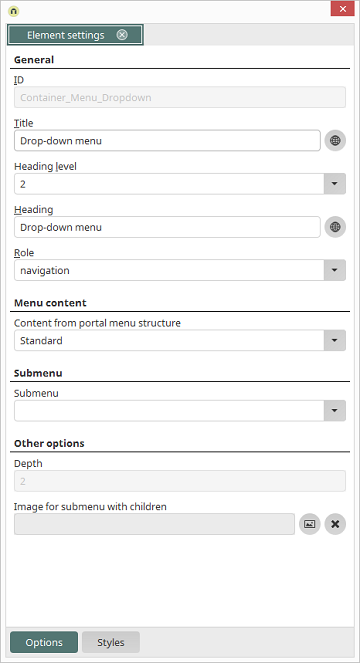 The image selected here is shown in the menu if it has subordinate (child) menu items. The filename of the selected image is shown here. Opens a dialog where the image, which should be used as a separator between menu items, can be selected in each case.